Home > Food Allergy or Intolerance? In North America, approximately 5% of children and 1-2% of adults have allergies to food, although many more individuals believe that they suffer from food allergies and restrict their diet accordingly. Some of these individuals have food intolerances; others may have food aversions, and some may have potentially life threatening food allergies. So how do you differentiate food allergies from food intolerance? 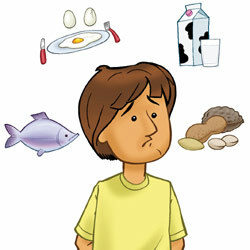 A food allergy is caused by a reaction of the immune system to a food protein. Even very small amounts of food can be dangerous to people with severe allergies. Food intolerance is any food reaction not caused by the immune system. The best known is lactose intolerance, which means that a person cannot digest milk sugar. Usually the symptoms relate to the gastrointestinal tract and although they may be unpleasant, they are not life threatening. milk, eggs, peanuts, tree nuts, soy, fish, and seafood. Allergic reactions to foods typically begin within 30 minutes of eating the food. If you suspect your child has a food allergy, you should speak to your family doctor or pediatrician. If the doctor agrees, he will refer you to an allergist, who will take a history of the reaction, examine your child, and usually do skin tests and/or a blood test. If the diagnosis is still not clear, a food challenge may be necessary to determine if your child is truly allergic to the food. Be aware of potential sites for cross contamination (e.g. shared utensils at restaurants). What to do if your child eats a food he is allergic to? For mild hives or swelling, watch your child closely and consider giving an antihistamine (e.g. Benadryl). If your child has a serious allergic reaction, he must be taken to the hospital immediately. Childrenprescribed adrenalin should carry it at all times! Most children allergic to eggs and milk will outgrow their allergies by ages 3 to 5. A small number can outgrow allergies to nuts, fish and peanuts so it is important to have regular follow-ups with your allergist. The doctors and nurses at the Montreal Children’s Hospital Allergy Clinic  are available for consultation.